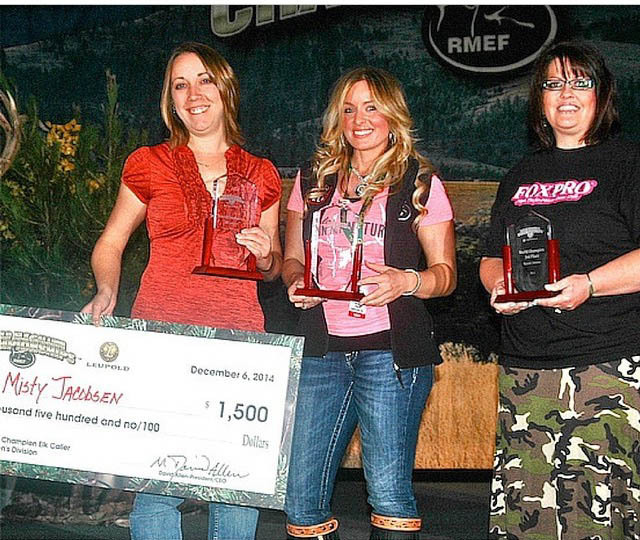 Kristy Titus on hunting fitness, nutrition and calling elk. Kristy is an elk hunting nut like the rest of us as a part of the Rocky Mountain Elk Foundation's Team Elk, a big supporter of Wounded Warrior Outdoors among many other accolades. On top of all that is a certified clinical sports nutritionist and has competed in the NPC figure division. Needless to say, Kristy knows a thing or two about fitness, nutrition and calling in big bulls. In this episode, we cover fitness for hunters, best nutrition for hunting, elk calling and early season tactics. The sound of a bull elk bugle resonates through the heart and soul of the hunter that pursue him. It is a sound that once heard, can never be forgotten. A sound that compels the hunter to return to the woods in pursuit of the most majestic animal on the planet, year after year without abandon. The elk speak to the hunter, telling a tale of what they are thinking, feeling and doing; the hunter but only has to listen and interpret the beautiful tale of the elk. The learning curve never ends, the elk are always teaching the hunter, sometimes the hunter gets the best of him and fills his or her tag, sometimes we walk away, lesson learned, memory made, cherishing the time pursuing him. Lessons learned from elk are hard earned. The price is worn boot leather, sweat, blood and sometimes tears sacrificed from the efforts of the compelled in this blessed dance between man and beast. Sharing my experiences with the royal giants of the forest is an honor. Getting out into wild country in pursuit of elk is something that some folks have only dreamed about, sharing with them, lighting the fire within their heart, and blazing the torch of those who’s fire for elk already burn. Cabela’s in Thornton and Lone Tree Colorado welcomed me, my stories and experiences on the mountain in pursuit of the bugling bulls into their stores for attendees to experience, listen and learn from my time spent afield. The language spoke, cow mews, chirps, estrous mews and cow bugles to the triumphant sound of the bull elk, location calls, display and challenge calls were all talked about and demonstrated with the use of my favorite Rocky Mountain Hunting Calls. My hope was to help inform attendees with how those sounds made are all about the emotion of the elk and how to better interpret that emotion based on HOW those sounds are articulated. The stalk and set up is what often brings a filled tag, so beyond the language of elk, I discussed common behaviors, traits and characteristics often experienced while afield from elk. The desire the elk have to lead with their nose, circling the hunter to the down-wind side and using that tendency to our advantage. The hang up or distance that they often feel safe in approaching, tactics on hunting elk solo and more. Talking about elk hunting wouldn’t be complete without discussing the great gear that Cabela’s has to offer, so I did a little shopping, showcasing some of my new Kristy Titus Collection of solid sterling silver jewelry by Montana Silversmiths and some of my favorite gear from Swarovski Optik, Wilderness Athlete and Buck Knives along with handing out a complete gear list with item numbers for shopping Cabela’s online. My gear list may be found by clicking HERE. Opening week of archery elk season is fast approaching and I wish all of the elk hunters out there the best of luck and memories made. The halls of the Rocky Mountain Elk Foundation’s Elk Camp are filled with God loving, gun toting, elk hunting, proud Americans and there is no better place to give a seminar about elk hunting than here, the heart of elk country. My seminar was an opportunity for me to share some of the amazing experiences that I have personally filmed while hunting elk on public land and the lessons learned while on the mountain. As a relatively young elk hunter, I have been blessed to share the mountain with some of the most experienced hunters in the world from the original inventor of the palate plate diaphragm elk call, Rocky Mountain Hunting Calls and four time world champion elk caller, Rockie Jacobsen, wildlife biologist John Caid, Red Creek Outfitters Steve Woolstenhulme and of course, my father Lewis Titus. All to which have helped and mentored me along the way to success in elk camp, all which in their own right have contributed to the format of my seminars through time together in the field doing what we love, hunting elk. It is an honor to share what knowledge that I have of the elk language both bull and cow sounds and some basic hunting strategies based on what the elk are telling us with that language. My hope is that everyone who attended learned something new and had a renewed vigor to climb the mountains in pursuit of elk. LAS VEGAS—Amateur and professional elk callers from California, Idaho, Nevada and Oregon are the new world champions for 2014. Competitors from four other states and two Canadian provinces also received honors. 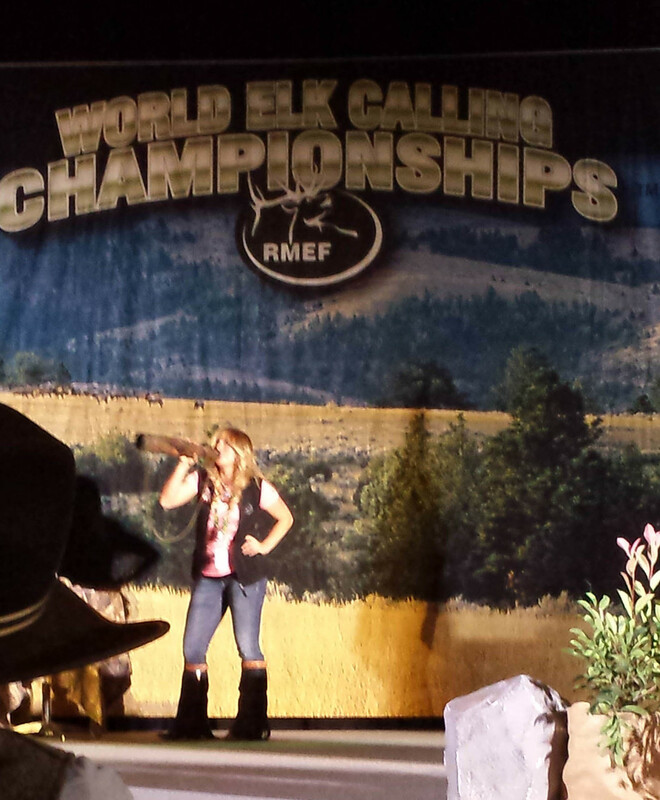 The 2014 World Elk Calling Championships, sponsored by the Rocky Mountain Elk Foundation (RMEF) and Leupold, were held during the annual RMEF convention and expo, which concluded Dec. 7 in Las Vegas. 1. Corey Jacobsen, Boise, Ida. 2. Bryan Langley, McMinnville, Ore.
4. Matt Brimmer, Keno, Ore.
5. Jason Phelps, Pe Ell, Wash.
6. Lance Sellers, Boise, Ida. 1. Dirk Durham, Moscow, Ida. 2. Shane Donner, Calgary, Alta. 3. Greg Hubbell Jr., Belmont, Calif.
4. Kevin Akers, Oregon City, Ore.
5. Tom Gonzales, Phoenix, Ariz.
6. Travis Jones, Stevensville, Mont. 1. Misty Jacobsen, Del Ray Oaks, Calif.
2. Kristy Titus, Prineville, Ore.
1. William Card, Fallon, Nev.
2. Trent Penrod, Lakeside, Ariz.
3. Sam Jacobsen, Boise, Ida. 1. Brayden Langley, McMinnville, Ore.
2. Austin Rose, Boise, Ida. 3. Russell Nemetchek, Saskatoon, Sask. 4. Isaac Jacobsen, Boise, Ida. 1. Sutton Callaway, Maricopa, Calif.
2. Kailee Brimmer, Keno, Ore.
3. Jessi Jacobsen, Boise, Ida. The event helps raise awareness of RMEF elk, habitat and conservation initiatives. In the competition, callers have 30-45 seconds to mimic cow elk sounds, followed by bull sounds. Most callers blow across a latex reed placed inside the mouth. In the natural-voice division, however, no calling devices are allowed. A variety of plastic tubes are used like megaphones, giving the sounds realistic resonance. A panel of judges scores each competitor anonymously. Winners received prizes and cash ranging from $500 to $2,500. Founded over 30 years ago, fueled by hunters and a membership of more than 200,000 strong, RMEF has conserved more than 6.5 million acres for elk and other wildlife. RMEF also works to open and improve public access, fund and advocate for science-based resource management, and ensure the future of America’s hunting heritage. Discover why “Hunting Is Conservation™” at www.rmef.org or 800-CALL ELK. The love of wild places and desire to not only protect those wild places but make them better than ever, stirred something in the heart of John Caid some 37 years ago. John is arguably the most experienced elk and wildlife biologist in the world having spent 35 years managing the White Mountain Apache Tribe Game and Fish Department and now for the past two years the Express UU Bar Ranches in New Mexico. An RMEF member since 1985, and former Chairman of the Board, John has lived a life demonstrating exactly how Hunting is Conservation. Because of RMEF, its members and supporters, elk numbers are on the rise thanks to sound management efforts, from people like John Caid, permanently protecting land, enhancing habitat, and the re-establishment of elk herds in historic ranges. In John’s book, The Golden Age of Elk hunting, he shares stories dating back to the 1940’s of some of the largest elk ever harvested, a historical perspective of trophy programs, hunting statistics, articles and essays on antler development, and even elk hunting tips. To say that I was excited to share the mountain in pursuit of a management bull elk on the 180,000 acre Express UU Bar Ranch with John is an understatement. Stay tuned and see for yourself how John and the Express UU Bar are working diligently to create a new and improved habitat management program coupled with a completely revamped wildlife management program. Striving to continually benefit not only elk but all of the wildlife found on the UU Bar and surrounding area resident wildlife including those found on our public lands. Be sure to tune into season 5 of RMEF’s Team Elk airing on the Outdoor Channel and find out exactly why today we are truly living in the Golden Age of Elk Hunting. Opening morning of archery elk season. This is the day that every elk hunter plans for and dreams about from the minute the sun sets on the final day. Opening day last year, public land hunters like me and my dad weren’t able to access this land because it was privately owned…but the Rocky Mountain Elk Foundation changed all of that. Snuggled between two wilderness areas in the icy-cold headwaters of the John Day River, 13,000 acres of privately held timberlands is now forever protected and open for all to hunt, hike, fish and explore. east border of prime elk habitat. This is a project that every public land hunter stands to benefit from with the area holding the most Boone & Crockett entries for typical Rocky Mountain Elk in the state. This is the story of the first public land hunt in the John Day headwaters acquisition. 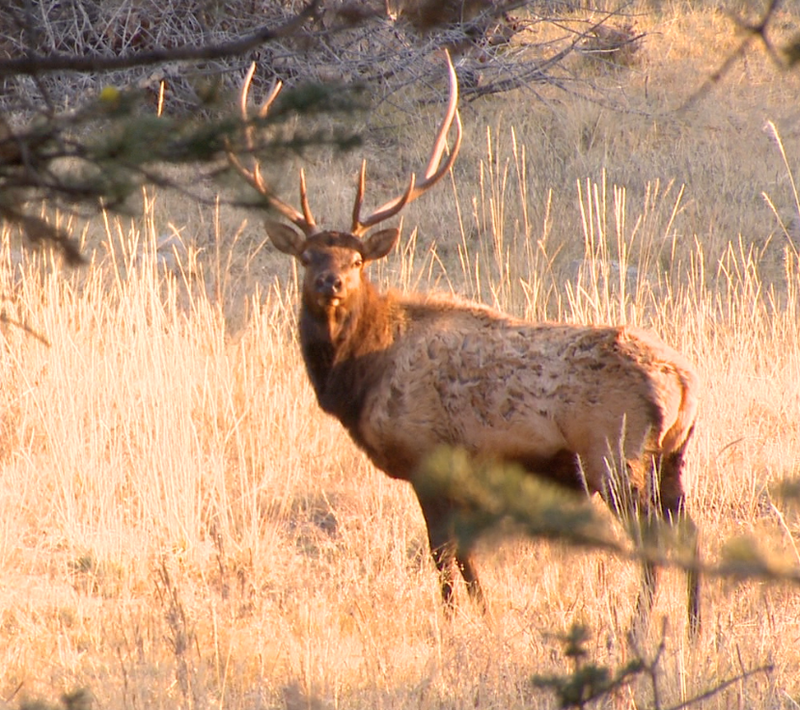 Stay tuned for season 5 of RMEF’s Team Elk airing on the Outdoor Channel. You have just watched your dream bull crest over the horizon. The magestic bull stands atop the mountain looking over his territory below; he is royal and knows that he is king. This was not a dream that I would need to awaken from. Don't blink...my dream bull was waiting for me as this was my reality in the mountains of Montana. Tune into RMEF's Team Elk this week with me and Vicki Reed hunt archery bulls in Montana. Thursday @ 10am, Saturday @ 6:30pm, or Sunday @ 6:30pm EASTERN. There's nothing as regal as the sound of a big bull bugling, and diehard elk hunters are already counting the days. Your legs are ready, but how about your mouth? CLICK HERE to read Kristy's 101 on elk calls from Rocky Mountain Hunting Calls.